My name is Kenneth G. Merrill. 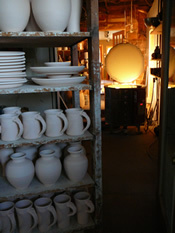 I have been a potter for two decades, and clay is still fascinating to me. The ancient craft of turning mud into bowls started thousands of years ago. 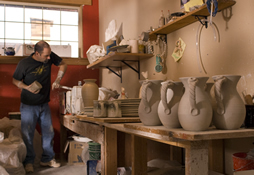 I make more than just bowls at my studio at Canyon Creek Pottery in Sisters, Oregon. My hand-thrown dishes, lamps, vases and much more are on display in the showroom located at 310 N. Cedar St. My gallery is a little hard to find, but if you like pottery, it is a must see in Sisters. Making pottery is a very solitary thing. You spend a lot of time in the studio by yourself. After spending 15 years alone in the studio I decided to open the gallery so that I could interact more with my customers. So five years ago I decided to open Canyon Creek Pottery. It's a little off the beaten path, but the quieter location allows me to get more work done during the day and spend more time with my customers. It is a very unique place. I got my start making pottery in a high school pottery class in Portland, Oregon. It came naturally for me in the beginning. In 1985 I took a production pottery job. I took it thinking I would make a few pots and then go get a real job. Well I have been doing it every since. Throwing is the term used to describe a piece being created on the potter's wheel. 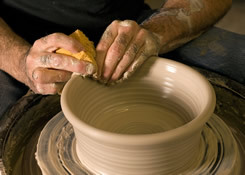 Wedged clay is positioned in the center of the wheel and is pulled and shaped by the potter's hands and tools as the wheel turns. 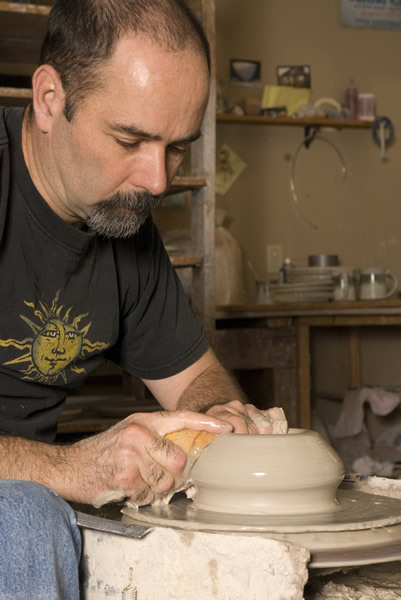 Throwing consistently is a challenge for beginning potters. It takes years of experience to throw good pottery. At first I felt like the clay had most of the control. At times the clay had a mind of its own. After 20 years of throwing I feel like I finally have mastered the art of throwing. The clay picks up part of everything you do to it, and it's reflected in the final result. 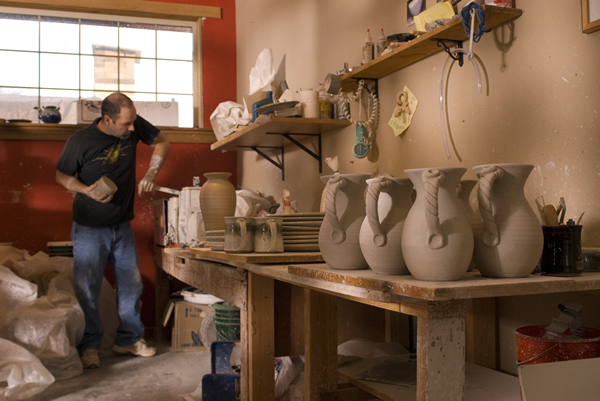 Throwing is the magical part of making pottery. 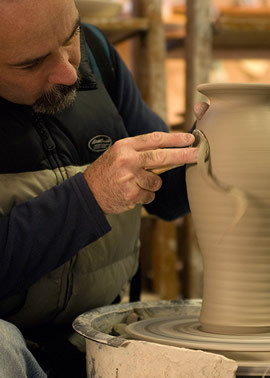 A lot of people think of pottery as art that they can't use, but it is very functional. You can use it. It's durable, tactile and visual. Every piece is unique, even in a 32 piece dish set they are all a little bit different if they are handmade.